We’ve been fans of the SodaStream for a long time. I blogged about how much I loved our old model way back in 2012, and I love this newer model just as much. This is the SodaStream Fizzi machine, which we got at Target. I’ll link you to the cool blue color, which I totally would have bought if they’d had it in stock at our local store. I tend to drink a lot of fizzy water—I don’t care for still water in general, so a little bit of. . . Read More! It’s been a couple of years since I really started getting into tea. Two years later, we’re still totally in love with the stuff. We started with Teavana, since there was one located very close to us, got frustrated pretty fast with their high prices and aggressive sales techniques, and moved online. We’ve tried a few different mail-order places; here are the ones we’ve tried, in order of how much we love them. 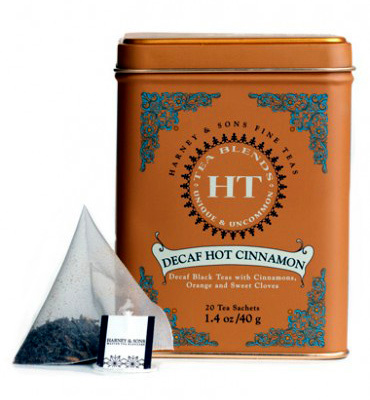 #1: Harney and Sons This link will take you straight to my favorite tea of all time,. . . Read More! I’ve never been a wine drinker. Many times I’ve tried, and many times I’ve failed to enjoy it. But through the years, I’ve made it to the point where I can drink a glass of Champagne (or other non-Frenchy sparkling celebration wine) without trouble. But still, wine eluded me. That is, until we went to Texas de Brazil, our favorite churrascaria in the world, with a wine drinker. He ordered a bottle of red wine (I had no idea what variety) and offered me some. I decided, why not, I’ll. . . Read More! I have a lot of teas to review, so I figured I’d break them up by source. That also gives me a chance to write about the tea-buying experience with each supplier, which I think is an essential part of the process. First up is Teavana. They have a large website that’s fairly easy to navigate, but they also have stores in malls and shopping districts throughout North America — there are certainly fewer stores in Canada and Mexico than in the USA, but there are still a goodly number. . . Read More! As a follow-up to my post about tea, I realized that I never posted about our other homemade-beverage machine: the SodaStream. Yes, I take issues with it being “soda” instead of “pop”. Though I justify it by telling myself that the machine itself makes fizzy water, or “soda” … and through the application of flavored beverage syrups, I turn it into full-fledged POP. Anyhoo. We got the very base model, the Sodastream Jet. (I link to it here at Amazon, because of the affiliate link, but we got ours in. . . Read More! We’ve decided to explore a strange new world … of tea. Specifically, loose-leaf tea. Which we figured was probably tastier than the stuff that comes in bags (and boy howdy, did we figure right). So instead of getting a perforated metal acorn-shaped tea ball or anything like that, we went with the techy gadget: Yes, the name is a bit overly clever. But the IngenuiTEA is a pretty sharp little item. Scott already has an AeroPress coffee maker, which he loves the everloving crap out of. And it certainly makes. . . Read More! As hinted at the end of my post about roasted garbanzo beans, I’ve embarked on using my roasting-toasting methods to make my own corn nuts. First, I tried hominy. Look, it’s even friends with garbanzo beans! I used the same methods as garbanzo beans, but the hominy shrunk a crazy amount when toasted. What came out tastes corn-nutty, and looks like itty bitty baby corn nuts. Seriously, these came out seriously small. Though I guess if you like feeling like a giant, you could use hominy for your corn-nutting needs.. . . Read More! I made more roasted garbanzo beans (or chickpeas, for those so inclined) the other day, and they continue to be delicious. And so very easy, as well! Here’s a little more detail. You can either use dry or canned garbanzo beans. This time, I used: Ooh, I guess for some there’s the third option of “chick peas”. If you’re using dry garbanzos, soak them in water overnight. Done? Good. Now you’re at the same step as if you’d opened up a can. Then move on to step two: Rinse those. . . Read More! My little lemon trees appear to have made it through the winter. They both dropped a LOT of leaves when the weather got colder, and I worried that they would both kick the bucket. You can see the general leaflessness of the Eureka lemon, but a couple of weeks ago I noticed that it was starting to bud like crazy. And those buds are now getting ginormous. Within the next week or so, that sucker will be flowering. The lemons that were growing on the Meyer lemon tree stopped getting. . . Read More! This was a surprisingly hard recipe to put together, only because there weren’t all that many recipes to reference on the internet. Half of the chocolate chip cookie recipes that mentioned coconut didn’t use actual coconut — they used coconut oil, or coconut flour (I admit, one of them was mine). Then you get into the gluten-free world, and my permanent frustration with recipes there: the bulk of them are either dairy-free or totally vegan. That doesn’t fly with me — like Paula Deen, I’m big on butter. So for. . . Read More!